Why?? 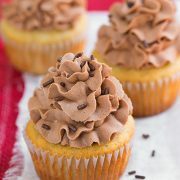 Why do I keep making cupcakes to just have around to temp me so all day long? Well, I love them so I’m not going to stop making them. I guess I’m just going to have to gift them a lot =). 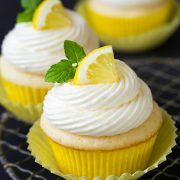 These cupcakes will basically leave you speechless! 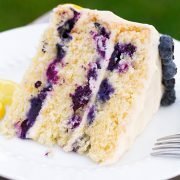 I made this recipe because the lemon blueberry combo is one of my new favorites. I’m so proud of the how the results turned out with this recipe (sorry I just have to brag a little about these)! You get a fluffy, moist, blueberry cupcake generously covered with an amazingly delicious, fluffy and flavorful lemon buttercream frosting and then to finish it off its drizzled with a nearly pure blueberry blueberry sauce. 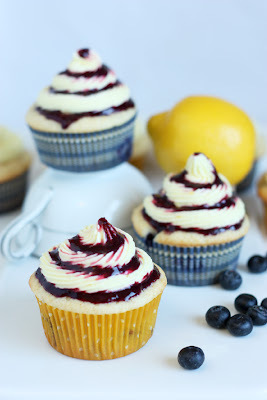 Soft and fluffy blueberry studded cupcakes finished with a bright lemon frosting and fresh blueberry sauce. Preheat oven to 350 degrees. In a mixing bowl, whisk together flour, baking powder and salt, set aside. In a large mixing bowl, using an electric mixer, blend together melted butter, vegetable oil and granulated sugar until well blended, about 30 seconds. Stir in egg, vanilla and lemon zest. Blend in sour cream. Add in flour mixture alternating with buttermilk in two alternate batches, blending until combine after each addition. Fold in frozen blueberries. Divide mixture evenly among 12 paper lined muffin cups, filling each one about 3/4 full. Bake cupcakes 20 - 25 minutes until toothpick inserted in center comes out clean. 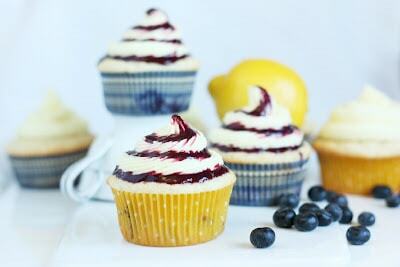 Allow to cool completely then frost cupcakes with Lemon Buttercream Frosting and drizzle with chilled blueberry sauce. 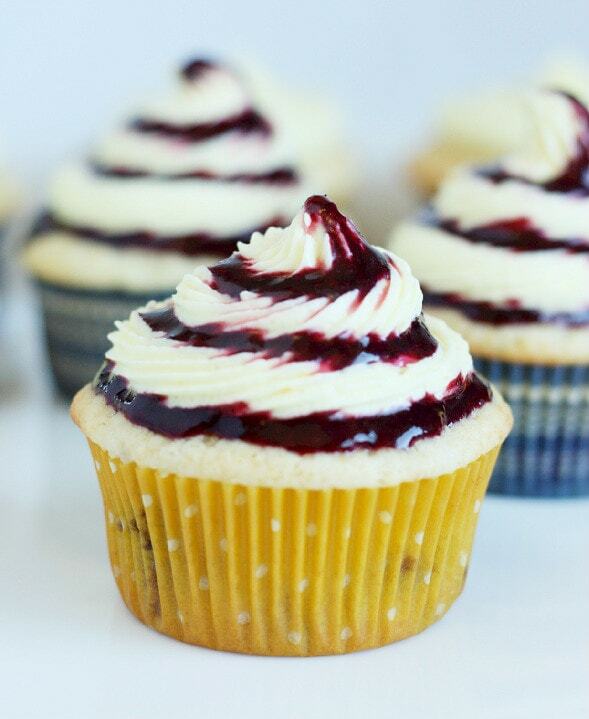 For best results, serve immediately after drizzling with blueberry sauce. Store in an airtight container. Note: if you don't want the piled high style of frosting (if you don't like a lot of frosting) then half a batch would be enough. Personally I don't normally like a lot of frosting but this frosting is so good that I liked the piled high style for these, plus it made for prettier piping with the blueberry sauce =). Note: I made this recipe to be more than enough sauce for drizzling the cupcakes. I liked it so much that I piped some of the sauce over the top then I served the cupcake with additional blueberry sauce. I loved it just that much =), but if you don't want that much blueberry sauce then half of the batch listed would be enough. You could always make the full batch and if you have left over you could use it for pancakes, smoothies or drizzle it over your favorite Greek yogurt (or just eat it by the spoonful its basically just pureed blueberries, yum).